Monthly Topic: China Bans Solid Waste and Recyclables Imports - R3 Consulting Group, Inc.
Beijing notified the World Trade Organization in July 2017 that it planned to ban the import of 24 varieties of solid waste and recyclables (e.g., certain plastics and unsorted paper), and lower the minimum required contamination level from 1.5% to 0.3%. The ban is part of a broader Chinese customs program called “Operation Green Fence,” which began in 2013 and aims to reduce waste importation and contamination of recyclable materials. The latest phase of this operation is called “National Sword” which increases enforcement and bans the import of many materials. The import ban went into effect January 1, 2018. This has already begun to disrupt the recycling industry as bales of recyclables are piling up in waste facilities internationally. Although the contamination threshold has been relaxed to 0.5%, facility operators say this standard is still very difficult to meet. Due to the United States’ large trade imbalance with China there is little demand for space in shipping containers returning to China, and historically, cheap shipping space has been filled by the solid waste materials our recycling industry sends to Chinese manufacturers. Combined with China’s large, inexpensive labor force, this made it cheaper for China to recycle imported material than to make those materials from raw feedstock. 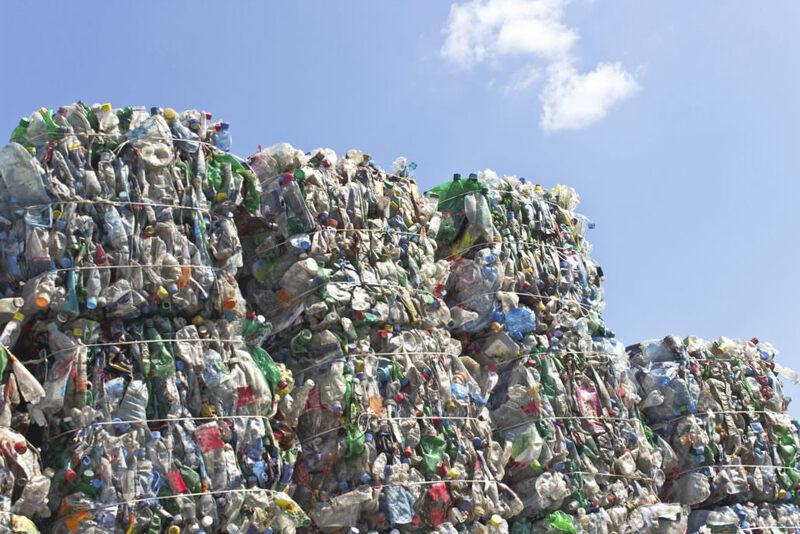 This dynamic also created a large volume outlet for the U.S. recycling industry, which has an abundance of scrap metal, paper, plastic, rubber and electronics that China needed to satisfy the demands of its growing manufacturing sector. Waste and recyclable materials are the sixth largest U.S. export to China, and in 2016 China processed at least half of the world’s exports of waste plastic, paper and metals. In 2017 news of the impending ban brought panic to recycling operators on an international scale. This change in international law represents a major upset to the flow of global recyclables, resulting in mounting stockpiles of waste materials in facilities that currently have no outlet. Many in the industry are concerned that this material will end up being landfilled or incinerated. China has stated reasons for these new policies are related to environmental and public health. Imported garbage reportedly is filling China’s landfills and polluting waterways, while its workers face dangerous conditions and exposure to toxic chemicals. Economically, importing foreign waste was also becoming less attractive for China as its cost of labor rose and the demand for materials fell, although we understand that Chinese paper mills and other recycling industries are now paying significantly higher prices for the raw material they once purchased overseas as recycling feedstock. For many materials collected through U.S. recycling programs sufficient markets and processing capacity do not currently exist outside China. Countries in Southeast Asia, such as Vietnam, Malaysia and Thailand, offer an outlet for the world’s exported waste materials but do not currently have the ability to accept the volume of recyclable material that was being shipped to China. The resulting surplus of materials will drive down prices for recyclables on the global market, while some materials have no clear destination. In addition, to help meet the 0.5% threshold processing facilities would need to slow down their sort lines and expend more labor to reduce contamination to an acceptable level, which will increase the cost of processing recyclables. Markets in China and elsewhere remain for higher grade recyclables and recycled commodities. The ban presents an opportunity to review and improve recycling programs, as exporting countries will need to consider ways to reduce their waste and enhance their own recycling systems. For example, “wishful recycling” has created a contamination problem that must be addressed, potentially through renewed public education efforts and/or advanced waste processing technology. China has grown increasingly concerned about how to better manage its own waste, and reportedly is limiting cheap waste imports in an effort to stimulate its waste management industry and establish an effective recycling system. At present it’s estimated that China generates more than 520,000 tons a day, most of which is landfilled or incinerated. China is also ranked as the globe’s worst ocean polluter, bringing hope that the Green Sword will catalyze a change in how much of China’s plastics and other waste ends up at sea.